Microsoft introduced the Recycle Bin with Windows 95, to keep the files deleted by user, whether intentionally or accidentally. But in the process of becoming a power-user, we grow some habits such as Shift Delete that serve us well most of the time. On the other hand, the flash storages of different kinds are massively used now-a-days; files are frequently written and deleted on and from those drives/devices. Now, if you've noticed, in none of these situations can the Recycle Bin help you recover your files. So if a careless and /or accidental file remove operation of these types has deleted a bunch of very important files of yours, then you my-boy, are in need of a good file recovery software. Recuva is a free file recovery software which can recover deleted files, even if they are no longer in the recycle bin, or the drive has been (quick-)formatted. Developed by the same company Piriform, which gave us CCleaner and Defraggler, Recuva is a light-weight software of just about 1.5MB. While there are many other file recovery software available on the internet, Recuva is very user-friendly, fast and light-weight compared to most of them, even if we leave out the fact that it is not nag-ware, ad-ware or trial-ware, but a completely FREE app. Recuva supports recovery from FAT12, FAT16, FAT32, exFAT, NTFS, NTFS5 , NTFS EFS file systems. Other than attached hard disks, it can also undelete files from the external storages and devices, connected to your computer such as, USB Drive, iPod, Camera, etc. It also has full support for email recovery from clients such as Microsoft Outlook Express, Mozilla Thunderbird, or Windows Live Mail. Although you will find most files in normal scan mode, which is lightning fast, Recuva also has a Deep Scan feature to recover deleted, corrupted, and overwritten files. File shredding is another noticeable feature of Recuva, using industry-standard secure deletion methods. It permanently removes the traces of the files' existence from the system; those shredded files cannot be recovered again even using Recuva. Recuva works on all versions of Windows from Windows 2000 and later. 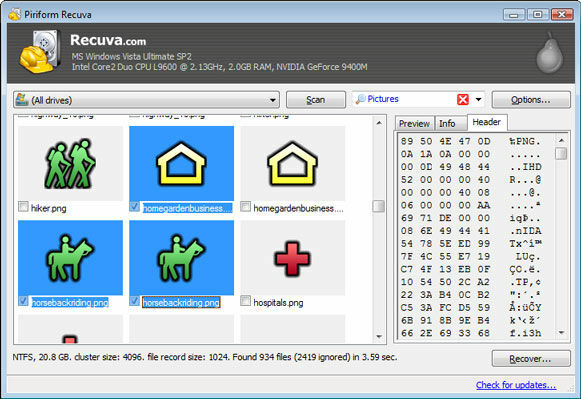 Piriform also offers a portable version of Recuva that can be run from a USB thumb drive on any Windows based PC. It is important to note that you should never install Recuva or any recovery software on the drive from which you need to recover files. This makes installing it on a USB drive the safest bet (unless it is the USB drive you wish to recover from!) You can download the latest version (currently 1.38.504) of Recuva from here or if you prefer to use a portable version which can be used without installation, you can download that from here. You can also check out our collection of other such free software here.